Valerie: We are calling upon Cosmic Sai Baba – it is Tuesday 13 December 2016, and we call with love and respect to make His presence. 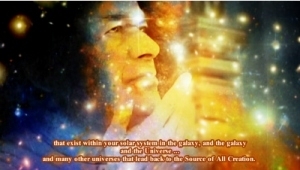 ❝It is I, Cosmic Sai Baba and I am very pleased to be here – I have been here for some time and I want to make it known that I am very pleased that you have connected to me in the Source of all Creation – because that is where you belong and that is where you have come from. So if you are thinking or feeling a need to return HOME – that is where it is. But you do not have to leave your physical earth body – that is part of your journey here upon this planet Earth. This Planet Earth is like a school, but, it is more than that actually. It is helping people to understand each other, no matter where they come from and who they are. And the images may not be the same – certainly there is some difference on your Earth planet with the Earthlings-with the Humans-that have faces that are sometimes dark and sometimes light and that gives the impression that you are different. You are in a Human Body that is exactly the same – you are a RACE! You are all operating the same way in the Earth Body. But there are many RACES IN OTHER WORLDS – and I have spoken about this before; and the images are not necessarily the same. And so this is what I am saying to you – that it is important that you accept and to realise that there is really no difference from any of those images – any of the physicalities of DIFFERENT RACES that exist in other worlds … because they all come from the Source of All Creation. Which you have come to call GOD – IT is a FORCE and God Beings are able to create from that SOURCE. And that is who you are. That is why you are here. As I have said (this planet) it is like a school but it is really a Happy Family – it is coming to know who you are – where you have come from – from other Worlds – and who you are now in an Earth Body. There is a Unity taking place upon this Earth that is filtering through – out of your atmosphere and into other Worlds as well. So it is more than just a school – it actually is helping for a growth – a unity to take place and an understanding of each other. There is complications in some ways of thinking The Source as God and that in a certain way – it is different from another way. But I can assure you it is not. It is all the same. The Source of All Creation is GOD. Only what I have spoken about in different physicalities and that is not always in a type of human or a star-person personality. You are warm blooded. You have emotions. There are others that have wisdom and they use their lives, their thinking, their consciousness to help others. And so I would like to remind you that there are many who are wiser because they do know and readily understand that there is really no difference in anything. Any form of life at all – has a consciousness – and it should be respected. I could say “revere it” but perhaps that is a word that has been misused over time – so RESPECT is the thing and CARING and the CARING comes with LOVE which is the Source of All Creation. THERE IS NO DIVISION – Please understand that. Think about it. And never, ever raise a thought of raising a weapon to sort out a problem. That does not resolve anything at all. It is the energy of LOVE and what I speak of as LOVE – is not just the sexual love that exists on this Planet Earth. It is LOVE without harming anyone. It is LOVE that unifies All and respects All. It is LOVE that exists in families that are brought together to experience that warmth – that caring – that nourishing energy that exists from The Source of ALL.